Kyle Kashuv, a student at Marjory Douglas Stoneman High School in Parkland, Florida, at the time of a mass shooting that killed 17 of his peers and staff last year, is calling out the leftist media for trashing a high schooler because he supports President Donald Trump and wears a Make America Great Again hat. 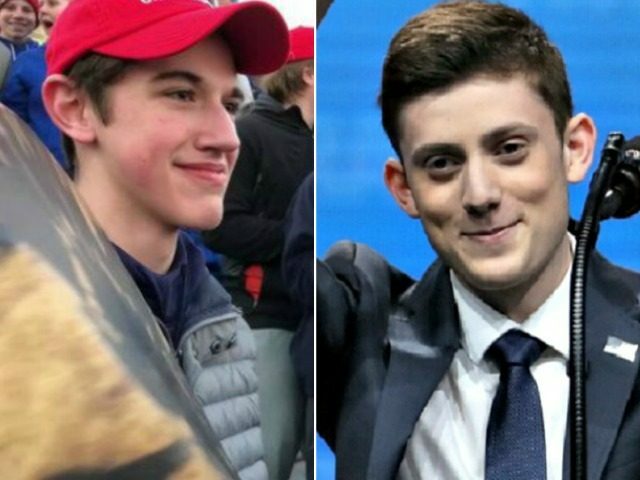 The fake news about a teen from Covington Catholic High School in Kentucky unfolded over the weekend, after Nick Sandmann and fellow students visited Washington, DC, for the March for Life, and also paid a visit to the Lincoln Memorial, where critics confronted them. Much of the media ran with a short video clip that seemed to show the students confronting a Native American man. But once the entire video footage surfaced it was clear that a group of self-described Black Hebrew Israelites from the D.C. area taunted the students, and Native American Nathan Phillips entered the scene beating a drum. Kashuv, who spoke out for gun rights after his high school colleagues called for gun control after the shooting, pointed out on Twitter that the same media praised the Parkland students for speaking out against gun ownership. Kashuv said the students were confronted with “racist, homophobic” slurs. Kashuv showed a video clip where a 71-year-old with a pro-Trump sign was tossed around by a couple of younger people. “Where was the media outrage then?” Kashuv said. Kashuv condemned the hatred expressed for Sandmann and the other young men, including some on social media who have promoted acts of violence against them. While some described Sandmann’s smile and silence as smug and arrogant, Kashuv praised his behavior. “He stood tall and looked at the other man face to face,” Kashuv said. I never interacted with this protestor. I did not speak to him. I did not make any hand gestures or other aggressive moves. To be honest, I was startled and confused as to why he had approached me. We had already been yelled at by another group of protestors, and when the second group approached, I was worried that a situation was getting out of control where adults were attempting to provoke teenagers. Sandmann said he is a “faithful Christian and practicing Catholic,” who respects people and would not take action that would lead to violence. Covington Catholic High School, an all-male private school, issued a statement denouncing the students but has not posted any other statements since the longer version video has surfaced. The school’s website is currently offline.